What is the legacy of JFK? Beyond controversy and nostalgia, what does the Kennedy Presidency mean today? Issues concerning global conflict resolution, world peace, nuclear arms, political leadership. with Featured Comments by John Shattuck (Rector and President, Central European University; former Chief Executive Officer, John F. Kennedy Library Foundation; former Ambassador to the Czech Republic; former Assistant Secretary of State for Democracy, Human Rights and Labor). Sandra Ristovska, Visiting Research Fellow at the Center for Media and Communication Studies at Central European University; documentary filmmaker and a PhD candidate at the Annenberg School for Communication, University of Pennsylvania. Her research explores the role of video in public discourse and policy deliberations with a particular focus on human rights video advocacy. 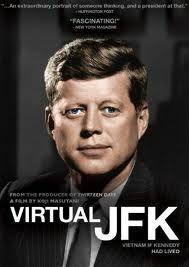 Peter Almond, Producer, "13 Days," Virtual JFK...", Consulting Producer, "The Armageddon Letters".